A-level results are out, the grades made the grade and the class of 2015 is eagerly thinking about what to pack, new friends and the experiences which will follow as they head off to university. Freshers’ fairs with photo booth hire on site are growing in popularity and here at Photoboothy we’re experiencing a rise in demand for university photo booth hire throughout London. Our rental photo booths – you can choose an enclosed photo booth, plain or customised, or a stand alone contemporary booth – appeal to higher education institutions which want to incorporate a fun souvenir element into a freshers’ fair. By now students know what’s in the academic syllabus, but perhaps less about sports, clubs and societies. Customised photo booth hires are ideal for capturing freshers’ fairs throughout central London. 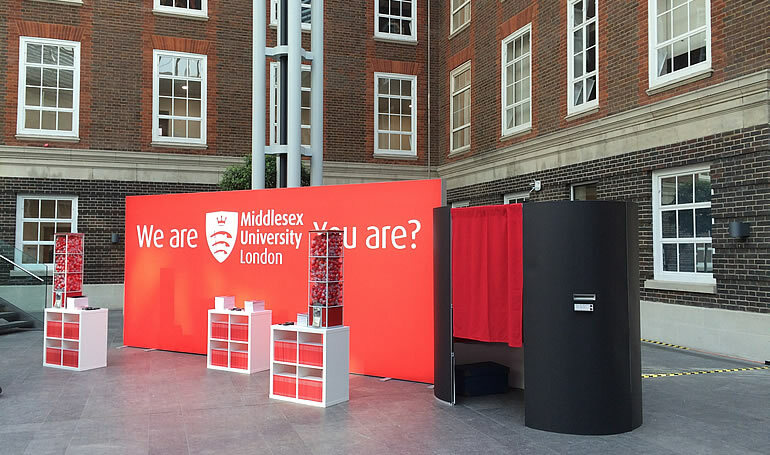 Earlier this year we went along to the North London Higher Education Fair and open day, held at Middlesex University, an event which boosted our profile as a quality supplier for photo booth hire. More people got to hear about us and we had a great time. Photo booth hire in the higher education sector is getting bigger for us, following customer interest and students spreading the word. Our booths are not only fun, but also functional pieces of equipment and simple to set up. We offer personalised strips – including logos, the freshers’ fair date, university website details and #freshersfair hashtags – at no extra charge and all our photo booths come with social media sharing options. We’re looking forward to working with more universities, having received excellent feedback to date from staff and students. So, congratulations to the class of 2015 – if you are organising a forthcoming freshers’ fair and interested in learning more about photo booth hire in London, please get in touch to tell us more about your photo booth hire requirements today. Madison, St Paul’s, has one of the most glorious views in central London, making it an ideal choice for IT services and solutions’ provider Kelway’s annual kick off, one of Photoboothy’s latest corporate photo booth hire London. Overlooking the iconic dome of St Paul’s Cathedral with the City skyline beyond, the venue offers sensational panoramic views. 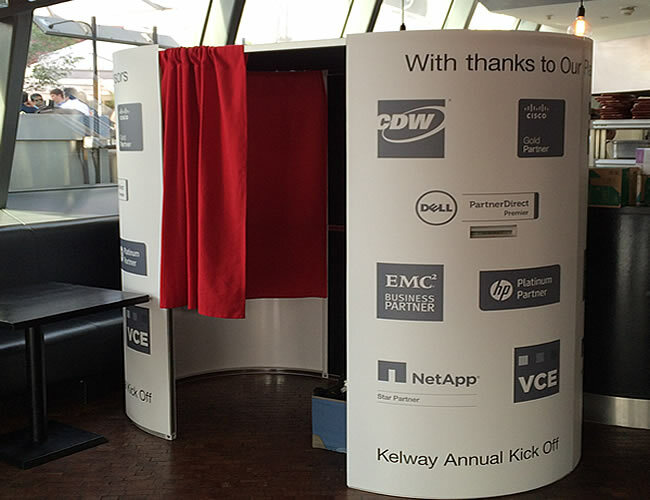 For this event, we designed an enclosed photo booth which Kelway used to name and thank various partner organisations. This type of gathering usually includes a review of operations for the past year, a roundup in relation to competitors and discussions on where the market is headed. Corporate rentals are a big part of what we do, but because we offer both enclosed photo booths or the stand alone contemporary type, there really is something for everyone, every space and every occasion. As schools finish for the summer holidays, photo booth hire has become increasingly popular for proms, now an established, stylish and glamorous right of passage for students once exams are over. Bar mitzvah celebratory parties are another occasion where we can set up a photo booth in central London and the surrounding Home Counties – again photo booth party hire provides wonderful souvenirs of an important family occasion that marks a young person’s move to adulthood. Corporate hires often ask us to include a #hashtag but all our photo booths come with social media sharing options as well as branded strips at no extra cost. We’re an experienced corporate rental supplier – but we have a passion for parties and proms too – and can easily customise an enclosed photo booth to incorporate your specific messaging requirements. We work throughout central London and further afield, so if you’d like to discuss our photo booth hire options, please get in touch today!